Hibs midfielder Scott Allan is the PFA Scotland player of the year for the Championship. Allan, 23, won the award at a glittering ceremony at the Glasgow Hilton last night. Allan was nominated alongside Hearts players Jamie Walker, Morgaro Gomis and Alim Ozturk. Walker, along with team-mate Sam Nicholson, were also nominated in the Young Player of the Year category, but that award was won by Celtic’s Jason Denayer. Ryan Christie of Inverness Caledonian Thistle was also nominated. 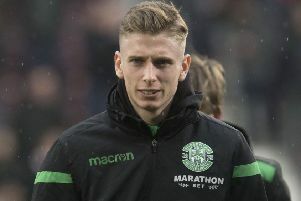 Allan joined Hibs in the summer and his consistent displays since then have played a huge part in the team securing second place in the league. The Scottish League One player of the year award went to Morton striker Declan McManus, with the on-loan Aberden striker scoring 23 goals so far this season. Arbroath’s Bobby Linn took the Scottish league Two player of the year award. Player of the year was Stefan Johansen of Celtic, while St Mirren’s Stevie Mallan won goal of the year for his solo strike against Dundee in December. Former Hibs and Livingston manager John Hughes was named as manager of the year, beating Celtic’s Ronny Delia, Abredeen’s Derek McIness and Hearts head coach Robbie Neilson to the prize.